McDermott International, a premier, fully-integrated provider of technology, engineering and construction solutions, has been awarded a sizeable contract by Daelim Saudi Arabia Company for engineering, procurement and construction (EPC) of CB&I storage tanks for the Ma’aden ammonia plant in the Ras Al Khair area of the kingdom. The fixed lumpsum contract, which is estimated to be around $50 million, encompasses the engineering, procurement and fabrication of four ammonia tanks and nine CB&I storage tanks, says McDermott International. Work on the contract is expected to begin immediately and will predominantly be executed from Saudi Arabia utilising McDermott’s local capabilities and facilities, it states. The contract will be reflected in McDermott’s fourth quarter 2018 backlog, it adds. 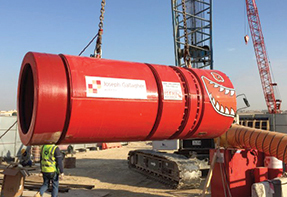 Joseph Gallagher International, a major tunnelling and civil engineering company, has joined hands with UAE-based Mechanical and Civil Engineering Contractors Company (Mace) to deploy its Iseki microtunnelling machine on one of the largest trenchless projects in Abu Dhabi, UAE. The project involves microtunnelling works to install more than 25 km of pipe for the Abu Dhabi Sewerage Services Company (ADSSC), which aims to provide high quality, sustainable, safe and cost-effective wastewater services to its customers throughout Abu Dhabi. The new pipeline will service local residents in two different parts of Abu Dhabi – Baniyas and Shahama, says Joseph Gallagher. The specialist microtunnelling machine systems and support equipment will install pipes varying in size from 400 DN to 2,000 DN and at depths from five to 30 m from the surface as part of this two-year contract. The two-year project will use Iseki and Herrenknecht equipment from the Joseph Gallagher microtunnelling fleet. Launch of the microtunnelling equipment in Abu Dhabi. Saipem, a major Italian oil and gas industry contractor, has been awarded two contracts worth $1.3 billion for engineering, procurement, installation and construction (EPIC) by Saudi Aramco to develop offshore fields in Berri and Marjan. These two contracts are linked to the long-term agreement for offshore activities in Saudi Arabia, renewed in 2015 and in force until 2021, and are located in the Arabian Gulf, which are among the most important offshore fields in the region. Saipem’s scope of works includes the design, engineering, procurement, construction, installation and implementation of subsea systems in addition to the laying of pipelines, subsea cables and umbilicals, platform decks and jackets. Saipem is a leader in drilling services, and in the engineering, procurement, construction and installation of pipelines and complex projects. Oman’s Special Economic Zone Authority at Duqm (Sezad) has signed up Premier International Projects (Pipoman) for the construction of an 8.3-km-long service road in the Duqm region of the sultanate, said a report. The RO3.8-million ($9.86 million) agreement for the service road construction project in Aman District will be implemented during 18 months. Nearly a month will be needed for the preparatory works, reported Oman News Agency. As per the agreement, Pipoman will design and construct an 8.3-km-long service road in Duqm near Sezad building, stated Yahya bin Said Al Jabri, the Sezad chairman, after inking the deal with Khalid bin Nassir Al Toobi, the managing director of the company. The road will serve the Royal Oman Police (ROP) facilities and intersect with the main road, Sultan Qaboos Road, that connects the Duqm Airport with the port, stated the report. The project involves four roundabouts, with entrances and exits extending from and leading to Sultan Qaboos Road, along with water drain facilities, protection and removal of existing utilities and LED streetlighting system, it added.